Different people use different yardsticks to measure the quality of Pad Thai. For me, the noodles represent that which makes or breaks this dish. True, the noodles alone don’t make a good plate of Pad Thai, but they do form the bulk of it. And when the noodles are badly cooked, they invariably drag everything down with them. In light of this, a post focusing on nothing but this ingredient is, in my opinion, entirely justified. Many people place the highest importance on the seasonings. Pad Thai seasoned with ketchup? Blasphemy, they cry. Well, it’s not that I disagree with that. It’s just that, personally, if better choices aren’t available, I would choose ketchup-flavored Pad Thai with properly cooked noodles over perfectly-seasoned Pad Thai with mushy, gummy noodles any day. As saddening as Pad Thai seasoned with ketchup or Pad Thai that is badly seasoned is, more so is Pad Thai with overcooked and soggy noodles. When that happens, there’s little, if anything, you can do to fix it. You can sometimes resuscitate Pad Thai with tough and undercooked noodles by moistening it with a little water, covering it with plastic wrap, and giving it a minute or two in the microwave. If the flavor of your Pad Thai is off, you can still adjust the seasoning after it has left the pan. Missing ingredients? I wouldn’t consider that the end of the world. But if the noodles are wet, gummy, and mushy — it doesn’t even matter if you get everything else right — it’s game over. That plate of Pad Thai has left this world and gone where there is weeping and gnashing of teeth. Nothing can be done to bring it back. 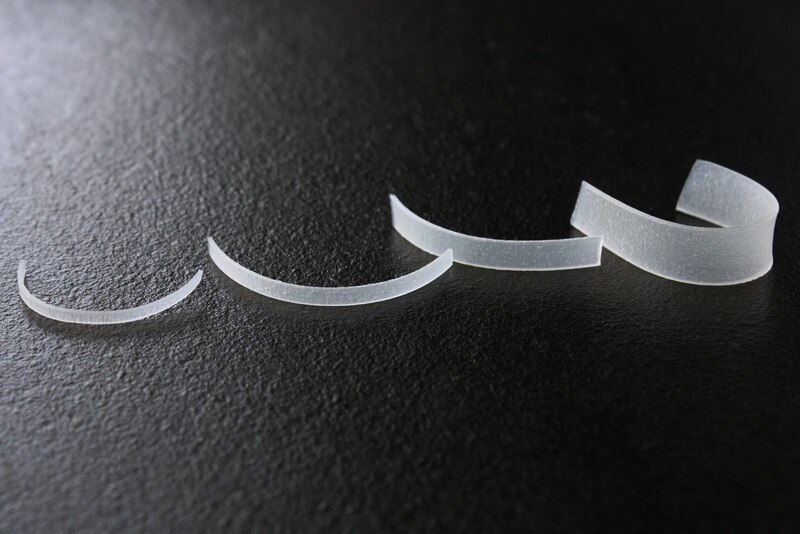 Dried rice noodles come in different widths, but they’re always flat. The first step towards keeping that from happening is to start with the right kind of noodles. Just because it says “rice noodles” or “rice sticks” on the package doesn’t mean you’re in the clear. These terms are used so broadly to refer to various types of Asian rice noodles (that are wildly different from each other and not at all interchangeable) that they’re almost meaningless. The noodles that are traditionally used in Pad Thai are thin and flat rice noodles, Sen Lek (เส้นเล็ก), that are sold dried most of the time. In Thailand, respectable Pad Thai vendors always use Sen Lek that comes from Chanthaburi province or at least ones that are made according to that tradition (and they often advertise that on their shop signs). Chanthaburi noodles are made from freshly-milled rice flour and still dried out in the sun the old-fashioned way (as opposed to machine-dried). They cook up nice and chewy, and that’s one of the marks of superior Pad Thai. However, this doesn’t mean that if you can’t get a hold of noodles from Chanthaburi, you’re doomed. As long as you go for the rice noodles that are thin and flat, preferably made in Thailand, you’re okay. Make sure the noodle strands aren’t round, though, as those are entirely different from Pad Thai noodles. These noodles are always flat. To prepare dried noodles for Pad Thai, simply soak them in room temperature water until the noodles are pliable yet firm. When you bite off a piece, it should be chewable yet feel unpleasant to eat. [The soaking time varies depending on the width of the noodles. For 3-millimeter-wide noodles, 20-30 minutes of soaking in room temperature water should suffice; for anything wider than that, increase the soaking time accordingly. You know the noodles are ready when they’re soft enough for you to twirl them around your fingers without breaking the strands (see picture above).] Then drain the noodles well and set them aside. I strongly recommend against blanching the noodles prior to stir-frying. 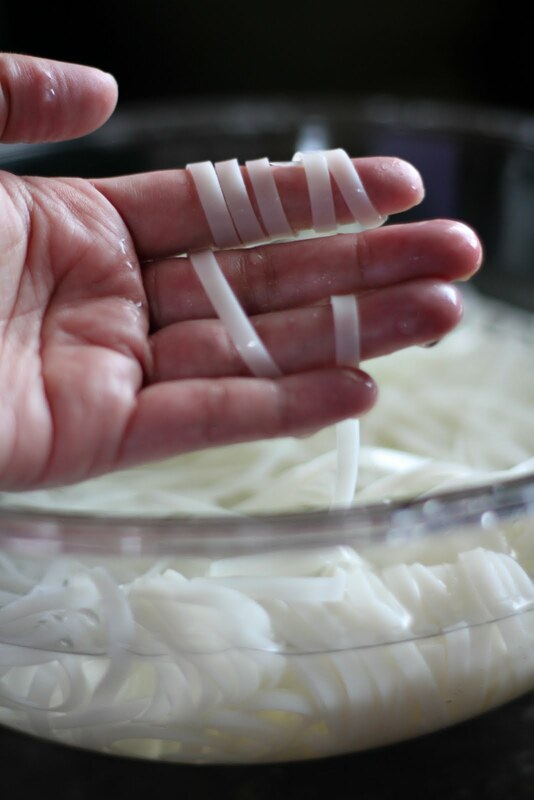 These rice noodles release tons of starch in hot water, and, as we all know, hot water + starch = glue. Blanching your rice noodles is a most guaranteed way of getting your Pad Thai noodles to clump up. (No respectable Pad Thai vendors have a pot of boiling water next to their pan for the purpose of par-boiling their noodles before frying.) The best method is to cook your pre-soaked noodles in a pan wherein the stickiness of any released starch will be offset by the presence of the oil. Thank you for this Pad Thai noodle primer! Because I’ve never attempted Pad Thai at home, I was unaware of the different widths. Perhaps it’s because I am one of those who pays more attention to the seasoning. I may be getting ahead here, but what is the best way to prep/soak the noodles (i.e. cold water for x-minutes)? Now we are getting serious about Pad Thai! I love how in-depth you are going with this. TN – I prefer soaking them in cold water for 15-20 minutes depending on the width. Some say you should soak them in hot water, but that introduces another variation (temperature of the water) to the scene making it more complicated. Worst thing to do to prepare these noodles for Pad Thai is to blanch them — most effective way to ensure gumminess. Can’t wait to try Pad Thai in my new 17″ cast iron skillet which will be delivered sometime next week. Thank you for all the wonderful tips. I never considered the size before. This was great – I feel so much better prepared to tackle this dish. I tried it once awhile back, but to your point my noodles were not up to snuff. I now feel somewhat braver about attempting this dish again. I really can’t wait for the rest of this series! I’m impressed with your detail!! Now I’m beginning to understand why the quality of this dish is one of the benchmarks I use to determine if a Thai restaurant is good or not! The first time I had Pad Thai, it was made with thin, cellophane-type noodles. I loved it. 😉 Not knowing any better, that was what I expected my Pad Thai to have. Surprisingly, most places I’ve had it have used that same kind of noodle, so I’m still happy, if not authentic. Still, it’s good to learn more about the right way to do things and the right ingredients to use. I just found your blog today, and I’m very happy to be here. Thanks! More Cowbell – Ah, wun-sen Pad Thai. That variafion is indeed delicious. A lot of people like it. 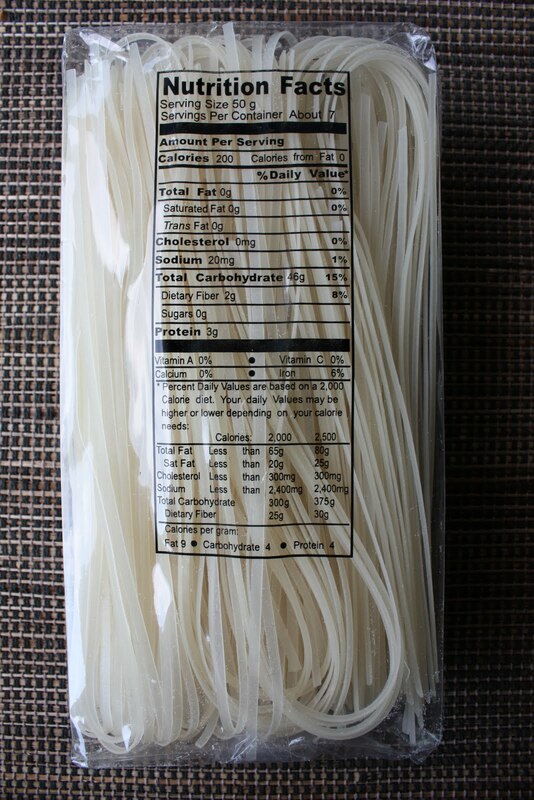 Feel free to use glass/cellophane noodles (which are made out of mung bean flour) in lieu of rice noodles. I have fresh noodles (3 mm size) and it still mentions soaking them for 20 min on the package. Will they still hold up if I do? I can see rinsing them, but don’t want them to turn to mush. Brier – 15-20 minutes for 3-mm noodles sounds about right. I tried 30 minutes in tepid water for 3mm noodles and found them to still be too tough more my taste. I’ll keep experimenting. Douglas – That’s because you didn’t cook the noodles long enough, not because you didn’t hydrate the noodles enough. Soaking is only how you prepare the noodles; not how you cook them. Douglas – Your comment made me a bit worried. You do know the noodles need to be cooked further in the pan for however long your recipe specifies, right? Admin (Leela? ), ouch you are killing me. Of course I cooked them – in your pad see-ew recipe. And they did soften up in the sauce but not quite to where I like it. Perhaps cooking longer will soak it up more sauce, but my cast iron skillet gets smokin’ hot and I didn’t want too much char. A little more practice then or maybe a little more sauce. BTW this is my favorite dish to add the nam prik pao. That pad see-ew recipe works best for wide, flat rice noodles. If you want to use these noodles, you’ll need to add more water along with the sauce and increase the cooking time. Do not add more sauce as you’ll end up over-seasoning it; just add plain water and cook until the noodles are soft enough to your liking (try a couple of strands to see if they’re soft enough). Once you get to that stage, add the greens, give it a couple of stirs, and it’s done. There’s a reason for not over-hydrating these rice sticks which I’ll be talking about in the last installment of the Pad Thai series. But the gist of it is that you soak them just enough to get them soft and pliable, but you don’t want them to drink up too much plain water that they can no longer soak up the flavorful sauce (while they’re being fried in the pan) without falling apart on you either. This is the hardest part about Pad Thai (hence the series as opposed to one quick post) — this balance. It takes practice and the kind of discernment that, unfortunately, comes after a few failed attempts. But back to the point — soaking the noodles longer can do more harm than good in most cases. Yes thinning out the sauce (like Italians with pasta water) makes more sense than more sauce. And it worked. It took about 5 T. to get it where I liked it and confident to make for friends, who loved it. Thanks. Can’t wait for your final Pad Thai recipe, but I have already taken a stab at the proportions from an America Test Kitchen recipe and it was really good. I love reading the comments, it makes this post even more helpful. this has gotten me abit confused though, I always thought the whole cooking process was meant to be done very quickly, street-food style? I had the best pad thai by a street vendor in chiang mai, and it was over in less than a min! Shu Han – Street vendors in Thailand use fresh rice noodles which are different from these dried noodles sold in the US; they cook much faster. Regardless, with all the factors involved (heat, type of pan, pan size, evaporation rate, etc. ), no recipe, in my opinion, should ever specify the length of time it takes for the noodles to cook. In my opinion, those who are learning to cook Pad Thai should never be taught to count the minutes but to develop the kind of discernment that helps them determine whether the noodles are ready. In the midst of so many variables, the most one can say is that the noodles should be soaked until they’re hydrated enough to wrap around your fingers and fried long enough until they’re thoroughly cooked. Common sense is a necessity here. This will all be discussed in the final post in the series. ah, fresh rice noodles. could have knocked my own head. i come from singapore, where our country’s equivalent to pad thai, the char kway teow, is also done with fresh rice noodles! I can’t wait to try out your recipe! Thanks for sharing! I’ve recently found your blog, and absolutely love it. Despite being a farang, I’ve spent quite a bit of time in Thailand and prefer great street food over most restaurants. While back in the US I grow my own spices (Kafir, Galangal, Lemon Basil, Chilis, etc …) and always enjoy the smiles from my friends when they taste authentic Thai food. On the idea of ‘Authentic’ Thai food, I try not to get too pedantic, as I’ve found, even within Thailand, the food changes significantly depending on vendor, location, etc. Phad Thai is probably the biggest example of a dish that goes through many mutations – though I will scowl and maybe even cry when I see ketchup added to Phad Thai. …Serving the Phad Thai in an egg. I first had this in the fresh market over by Chattachuk but do see it on the streets occasionally. …Adding shredded green mango. I think I 1st had this on Samranraj Road (over by Wat Saket) but don’t recall for sure. This has become my most common preparation when at home. Exactly. Totally agree with you. I’ve never had Pad Thai with green mangoes added. The most unusual permutation I’ve had is one made with grated green papaya instead of rice noodles. I don’t like it, but apparently some people do. Could be the low-carbers. Are Phat/Pad Thai supposed to be eaten cold or hot? Anon – Warm or close to room temp. I stumbled upon this website after a search on how to make tamarind paste for a pad thai recipe. I (literally) just finished my first foray into pad thai, and am mostly pleased with the results. I do wish I’d read this particular thread beforehand, however, as my noodles are a little tough. I was concerned about cooking my noodles longer because they seemed to be getting sticky in my wok. Perhaps I needed longer cooking, but also more oil?? I used three tablespoons oil for a one-pound package of fresh noodles. Does this usually suffice? Alisa, yep, definitely more oil (I use 1/3 cup of oil for 8 ounces dried noodles), longer soaking time, and perhaps longer frying time (especially if your noodles are on the wide size). But as I’ve somewhere in the five-post series, there are many factors at play. The width, depth, and material of your pan affect the outcome. Wider, shallower pan = faster evaporation which means the sauce may evaporate before it has enough time to season and soften the noodles, etc. In the beginning, when you still have a hard time telling when the noodles are soft enough, pick up a strand and taste it. If not, fry them longer, adding as little plain water (not more sauce, though, as that would result in over-seasoned pad thai) as needed. Also — and this is key — unless you have large, shallow pan (at least 17 inches in diameter), do not attempt to fry the whole 1-lb noodles in one go. Think of how it’s done on the streets in Thailand: one or two servings at a time for best results. Wow! What a great resource. I’ve read so many recipes that called for par boiling that turned my pad thai into mush that I can’t tell you. Those recipes are all over the internet. First off….I LOVE to cook. The discussion about how long to soak the noodles in room temperature water sparked my interest and I decided to do a little test of my own. The only rice noodles I happened to have on hand were the large noodles, so I’ll try this with smaller sizes. 28 hours later I finally used the noodles, which had set out at room temperature the whole time. I observed NO change whatsoever in all that time and they cooked up just perfectly. They appear to soak up just the right amount of water whether you soak them for a couple of hours or for more than a day! I saw no difference whatsoever. This was a very valuable discovery because I like to cook for all my friends and being able to start soaking the noodles well ahead of time, without any noticeable degradation whatsoever, is a huge advantage when I’m cooking for a lot of people. Thanks a lot for this site! I’m working on sauce recipe now 🙂 That’s still a bit of a mystery to me trying to follow the directions. Thanks for sharing this with us, Steve. This is very helpful. I’ve never tried soaking noodles for an entire day, but I’ve never had a problem leaving the noodles soaking for over an hour. Like Steve, I find the Pad Thai noodles fairly forgiving when soaked in cold water. I’ve also attempted to blanch them once, just to see how they came out. In my case, I brought the water to boiling, dropped in the noodles for less than a minute, and then IMMEDIATELY drained them and rinsed them thoroughly with cold water. They actually turned out ok—not gummy and soggy. But I could see how this has the potential to lead to disaster if one’s not careful, and I’d just as soon not waste the energy when it’s easy enough to soak them for 20 minutes. I am soooo upset. I tried making Pad Thai this evening using the http://www.food.com website and it was definitely a failed attempt. I wish I had discovered your site earlier. I soaked the XL and L noodles into boiled hot water and drained out the water. I attempted to fried it with the sauce and meats however, the noodles are now very soft and mushing..now it is just a wasted effort. Thank you for your site. Well that was an undertaking. First run did not work- the noodles just did not get soft enough. Learned and repeated. The sauce was magic. Noodles turned out great- no clumps or stodginess. Thanks so much for your compressive recipe. I just grated my palm sugar with a regular cheese grater- so easy- melted really quickly. Thank you. I just started making pad thai last weekend and the noodles have been the death of my recipe. I can’t wait to go to the store and buy the right ones. You are so right, this topic definitely deserved a full post. This pad Thai recipe is better than some I’ve had in restaurants – and I can customize a bit! I make the sauce ahead and freeze it, so the dish comes together pretty quickly. After reading some comments, next time I will try with the glass noodles I like so much. Thanks for everything! The package of rice noodles I have says to soak the noodles in warm water for 60 minutes. I prepared some luke warm water and soaking them now. Will see how they turn out. In the past I’ve had some success blanching the noodles (2-3 minute simmer) and washing the al-dente noodles in cold water through a strainer…better to be patient and do it right though.